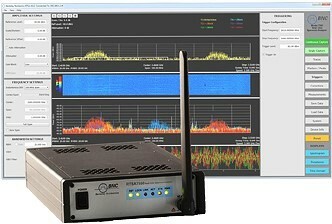 ...monitors wireless signals in real-time for seeing intermittent and frequency-hopped signals. Fairport, NY, USA: Saelig Company, Inc., (Saelig) (www.saelig.com) announces the availability of the compact RTSA7550 Real-Time Spectrum Analyzer - a powerful, full-featured spectrum analyzer designed to analyze wireless signals in real-time (not progressively scanned). This is essential for seeing intermittent and frequency-varying signals. The Model RTSA7550 has all the standard features of a conventional spectrum analyzer such as frequency controls, marker functions, and multi-trace functionality. Instead of scanning through a frequency range, the RTSA sees all frequencies at once, thus catching intermittent signals or transmissions that vary dynamically in amplitude or frequency-hopping. The PC-controlled RTSA7550 includes: 9 kHz to 8, 18 or 27 GHz frequency range; real-time spectrum graphing; real-time spectrogram viewing; real-time power spectral density display (persistence); real-time triggering; real-time time domain display; and real-time recording and playback. Real-time triggering allows for measuring complex data signals such as Wi-Fi and LTE. Sophisticated FPGA-based digital signal processing within the RTSA7550 enables the capture of elusive time-varying signals across an instantaneous bandwidth of up to 160 MHz. The RTSA7550 has all the standard features of a sophisticated, expensive bench-top spectrum analyzer, but at far lower cost since it uses the display and processing power of an attached PC. The real-time analysis of the RTSA7550 combines patented, low-cost digital software-defined radio technology, open source software, standard APIs, and a PC-controlled architecture to provide unparalleled performance in a very economical instrument. And the widescreen view of a laptop or PC monitor enables enhanced viewing not available on instruments with built-in screens. Monitoring dynamic and agile signals usually requires a large budget instrument, but the RTSA7550's advanced real-time spectrum analysis performance comes at a price that is as affordable as an ordinary spectrum analyzer. It utilizes industry-leading APIs/standards (including LabView drivers) and open-source code to allow easy customization, remote control, and installation in test fixtures. The Model RTSA7550 has a 10 MHz input for external references and a 10 MHz output for multi-unit synchronization. The analog I/Q output can be connected to high speed digitizers or post-processing software tools. Outputs are provided for external triggering or exterior modules such as antenna switches, down-converters, and GPS. A 10/100/1000 Ethernet port is provided for control and networking. A +12V DC power input allows the RTSA7550 to be used during mobile testing using automobile battery power. The RTSA7550 can be utilized anywhere in the wireless ecosystem. It is a powerful and cost-effective solution for spectrum analyzer needs in the lab, on the manufacturing floor or out in the field, R&D, education, manufacturing, deployment, and monitoring. An important and useful feature of the RTSA7500 is the ability to make measurements remotely via the Internet. This is ideal for monitoring applications where personnel are not always available.